Are you encountering issues with your Rachio Wireless Flow Meter? We’re here to help! The information below will help target and solve any problems you may be experiencing. If you're installing a new Rachio 3 controller along with a Wireless Flow Meter, your controller will automatically check for firmware updates while pairing to the flow meter. Necessary firmware updates will complete automatically (this can take about 3-4 minutes to complete). Want to manually check for firmware updates? Go to "More" tab > "Controller Settings" > "Technical Info" > "Update Firmware". Trouble pairing your Wireless Flow Meter with Rachio 3? 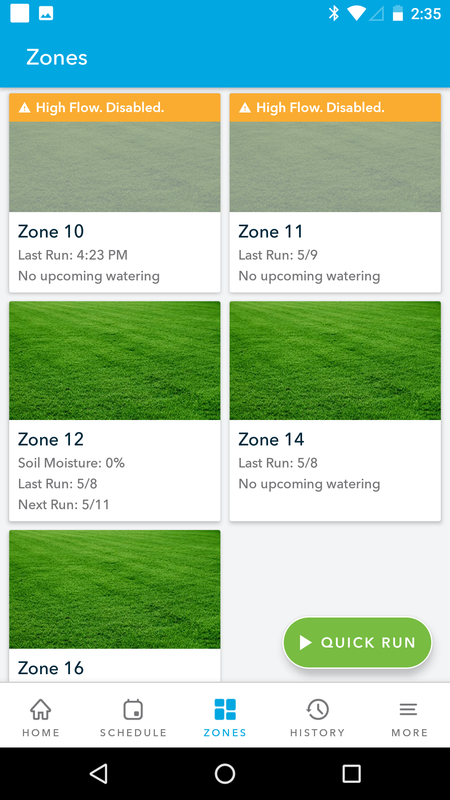 If your Wireless Flow Meter is having trouble pairing with your Rachio 3 Smart Sprinkler Controller, first check to make sure your Rachio 3 is online. If your controller is offline, you should see a banner that says “Offline” on the app’s Home screen (below the name of the controller). You can also check controller status by selecting the “More” tab and then tapping the name of your controller. If your controller is offline, follow these troubleshooting steps. After confirming your Rachio 3 controller is online, you'll want to check the light status on the faceplate of the flow meter. After the flow meter successfully pairs with the Rachio 3, the green success light will remain solid for about two minutes before turning off to conserve battery. If there is no light displaying, test the batteries. Using a flathead screwdriver, remove a single battery from the flow meter, wait a couple seconds, then put the battery back in flow meter, wait a couple seconds, then put the battery back in (this will restart the pairing process). As soon as the batteries are in, flip the flow meter over to check for lights. If there is no light displaying, replace the batteries with 2 new AA batteries. If there is still no light displaying after batteries have been replaced, contact Rachio Support through the app or the Help Center. If the flow meter displays a blinking green light, with blinks approximately every 3 seconds, it is in pairing mode and attempting to connect to the controller. If the LED light goes from blinking green to solid green, connection was successful! Continue with installation, and be sure to screw the battery cover on securely so that it is waterproof. If the light does not turn solid green and continues blinking green, revisit the app and note any error screens. The flow meter may be too far from the controller, or there may be obstructions (such as objects, walls, soil, etc.) preventing pairing. Take the flow meter to the location of the controller. Remove the batteries, then put them back into the flow meter, and check the Rachio app to see if pairing is successful. If it pairs at this point, the flow meter installation site is too far from the controller, or there is other interference. If there are objects between the flow meter and controller, move them and try to pair again. If there are no objects, the controller may be too far from the controller and they will not be able to use a flow meter with their system. Contact support. If the light turns solid green, you have successfully paired your Wireless Flow Meter with your Rachio 3 - congratulations! Continue installation using the installation manual, and be sure to screw the battery cover on securely so that it is waterproof. If the light is red, contact Rachio Support from within the Rachio app. Is your Wireless Flow Meter listed as "Disconnected" within the Rachio app? If the troubleshooting steps above do not work, contact Rachio support through the app or the Help Center. High or low flow notifications, but no sign of an issue? Most notifications for high or low flow are the result of a leak, or other issue with your sprinkler system. However, there are a couple circumstances where your system may report a false positive. We recommend treating every instance of high or low flow reporting as a potential issue until proven otherwise. For low flow, check out the affected zone during watering and look for decreased water pressure, sprinkler heads not popping up, and other physical issues. Fix any issues, or contact your irrigation professional for help. If the user is receiving frequent low flow notifications, there may be high neighborhood usage (if, for example, all surrounding yards are watering at the same time) or a spike in household water usage (if showers, washing machines, or dishwasher are run at the same time). You can decrease flow sensitivity and alerts by lowering your low-flow threshold by 5 gpm. Continue to lower by 5 gpm (gallons per minute) until notifications stop. For high flow, check during watering for geysers, bubbling water around sprinkler heads, partially broken heads, or overly moist earth. Fix any issues, or contact your irrigation professional for help. If there are no signs of high flow or leaks and believe you are receiving a false positive, you can increase your high flow threshold to decrease sensitivity. If the notifications return or your water bill increases from previous months with similar usage, there may be an underground leak - contact your irrigation professional for help. If you would like to continue monitoring without missing watering in the affected zone, you may disable auto shut-off within your settings. If you receive frequent alerts detecting Inactive Flow, you may be receiving false positives - this can happen if your sprinkler system takes longer than normal to depressurize and your Settle Time is set to the default of 3 minutes. To help your Flow Meter to recognize this depressurizing time as normal, edit your Settle Time. In the Rachio app, go to the "More" tab, then select "Controller Settings", then "Flow Settings", then "Settle Time" to increase the amount of time your system will settle/stabilize before checking for inactive flow. Settle Time can be customized from 1-10 minutes. If your Rachio Wireless Flow Meter is not reporting flow, your controller may be offline (which will cause the flow meter to lose connection in turn). If you have a wired flow meter and the usage graph on the Home screen is reporting 0 gallons of flow, your flow sensor may be broken. Rachio cannot detect issues with any flow meters other than the Rachio Wireless Flow Meter. If you’re experiencing issues, please contact your flow meter’s manufacturer for troubleshooting help. Have you received multiple notifications about your flow meter going offline? Follow these troubleshoooting steps to bring your controller back online. If your flow meter frequently falls offline, make sure there are no obvious obstructions between your controller and your flow meter (such as large objects, walls, soil, etc.) which could interfere with the signal. If possible, remove any obstructions to prevent further loss in connection. Check out this support article for step-by-step instructions on battery replacement.